A Guide to Fashion Sewing, 6th Edition, provides a comprehensive fashion sewing resource for beginning and advanced sewers alike. Readers will learn how to assemble and construct designs of various styles using proven industry methods for more than 100 sewing applications. Chapters cover everything from sewing equipment, measurements, and fabric selection to actual garment assembly. Filled with easy to follow, step-by-step instructions and large, clear illustrations, this book is an indispensable resource for constructing quality garments. Accompanying video demonstrations help readers learn at their own pace basic sewing skills and techniques such a seams, darts, bias binding, zipper, and garment assembly. The new edition features an updated design, new industrial sewing machine information and photographs, and expanded information on tailoring. Amaden-Crawford has added convenient metric measurement equivalents to the text, helpful project checklists to aid self-assessment of completed project, and 1/2 scale patterns to make sample garment assembly easier than ever before. PLEASE NOTE: Purchasing or renting this ISBN does not include access to the STUDIO resources that accompany this text. To receive free access to the STUDIO content with new copies of this book, please refer to the book + STUDIO access card bundle ISBN 9781501395284. STUDIO Instant Access can also be purchased or rented separately on BloomsburyFashionCentral.com. Connie Amaden-Crawford is President and CEO of Fashion Patterns by Coni, a member of the Sewing Hall of Fame, and a licensed designer for The McCall Pattern Company under the Butterick label. 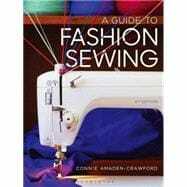 She is author of The Art of Fashion Draping, 4th Edition (Fairchild Books, 2012).